From the prototypes we are looking at, we are finding that on-demand writing is especially prevalent in Smarter Balanced and PARCC. 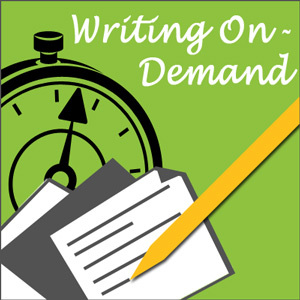 On-demand writing is also an important skill for students to have in situations such as the rise of social media and college and career readiness. Time management is the ultimate solution for student success with on-demand writing. I’ve found that by teaching my students how to allot and judge time during their writing, they’ve become more confident when it comes time for on-demand writing. I did this by having my students practice writing with different timed allocations, beginning with 40 minutes. I then gradually lowered their timed writing to 10 minutes. As your students become more comfortable with timed writing, you will notice their skills improving, especially in their shorter on-demand writing pieces. 1. Assigning writing prompts will help with on-demand writing. Within a WriteSteps unit you’re given the opportunity to assign a prompt or a “free choice” write. Have your students write in response to the prompt in a specific time frame. When assigning a prompt, choose one that relates to your other subject areas. By having students write about what they’ve read in ELA, science, social studies, or math, you’re helping prepare them for the on-demand writing they will do on tests, in other classes, and in the work place. 2. Planning helps students focus their thoughts and organize their on-demand writing piece. I always have students plan before they write. This is taught in a step-by-step, strategic way. The goal is that through repetition, students will start to plan automatically whenever a writing assignment is given, whether it is a long writing piece or a shorter on-demand piece. Students in kindergarten begin practicing stating the topic. 1st graders write a paragraph for which they have planned the topic and include three facts or reasons. Students in grades 2-5 become skilled at planning multiple paragraph essays. 3. Conferencing with students boosts their self esteem and confidence, which is needed for on-demand writing. Help each student identify their personalized goals by using a rubric, editing checklist, or revising checklist, and by asking your student to reflect on their writing. I’ve found this helps students find their errors when they’re writing an on-demand piece for which they will have no time for peer editing and revising. Students will not need to identify all errors in a timed writing piece, just those that might impede understanding. It is the philosophy of many standardized tests, including PARCC and Smarter Balanced, that spelling and grammar do not harm a student’s score unless they make it difficult for the reader to understand what the writer is saying. 4. Self-assessment and reflection help a student to know themselves as a writer, which is beneficial for on-demand writing. One of my favorites tools that I like my students to use is the six traits rubrics. Students score their own writing and use the document to set goals for their writing improvement. Not only do students fill out the rubric, but they answer a short questionnaire that asks them to identify their strengths, weaknesses, goals, and areas for which they would like teacher assistance. This type of self reflection helps students prepare and improve from one writing piece to the next, regardless of length and time frame given. The on-demand type of writing is becoming more prevalent in social media, standards based testing, and in preparing students for college and career readiness. One of the four ways teachers can increase students’ aptitude for writing on-demand is by including both longer duration writing with all steps of the writing process, as well as shorter on-demand writing. Have you noticed a difference in your students’ longer duration writing versus their on-demand writing? What stories can you share with us?